Lutz Huelle Fall Winter 2016 collection was relaxed and playful. 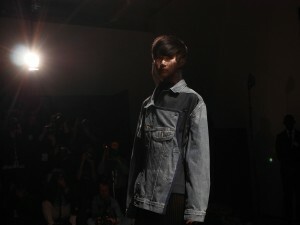 The outfits were embellished with sequins and denim details, giving a urban touch to the whole collection. Indeed, layered looks were made of sequins cuissards, long loose knitwear purple or blue and lozenge-shaped long earrings in black or gold sequins falling on shoulders. Plissés dresses went back to a more classic style, giving a balance to the street influences of the season. Touches of red and yellow, in a collection with a main denim blue and black palette, were spread along the collection in a long red perfectly cute wool coat or a short bomber oversized jacket coming in navy blue and red. Classic pieces were revisited: the denim jacket stayed true to itself becoming a long coat in mixed denim, while the bomber nylon jacket also gained some length becoming a mixed textured coat. Finally, some draped purple and red dresses gave a more feminine vibe to the collection. A final word? Clever and fresh.